Ben Castleman gained attention with a text-message-based approach to encouraging first-generation students to enroll in college. He’s now seeking to help them finish degrees. Ben Castleman is taking a great idea to the next level. Known for pioneering the use of text messages to “nudge” low-income high school students into following through with their plans to attend college, the University of Virginia associate professor of education and public policy is in the process of kickstarting a new, five-year strategic initiative. Partnering with Virginia and other states, he hopes it will result in more students completing college and, eventually, landing better-paying jobs. The initiative will employ a combination of nudges and data science strategies that Castleman has previously used to great success with various public agencies and organizations, including as a senior adviser to former first lady Michelle Obama’s “Up Next” campaign. 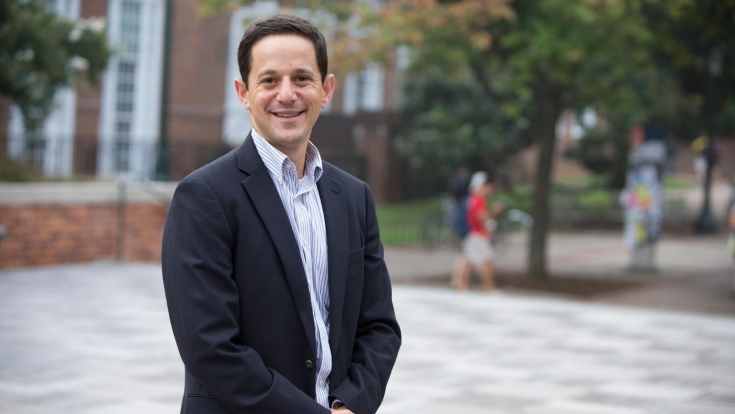 To learn more about the initiative – as well as other things he is working on – UVA Today caught up with Castleman, who holds faculty appointments in the Curry School of Education and the Frank Batten School of Leadership and Public Policy. Q. Most of your previous work focused on getting kids to college; now your work is getting students to finish college? A. On one hand, I certainly believe from a policy perspective that we should continue to support low-income students to get to college, but the fact of the matter is once students get to college, they still have to get through several years in order to graduate. College completion rates remain stagnant and low for low-income students. So my interest, as you alluded to, has increasingly become, “How do we look further down the pipeline? How do we find similar kind of high-leverage opportunities for students who are most of the way to a degree, but have either already withdrawn or are at risk of doing so?” Because if we can design an intervention for a student who only needs to take two or three classes, the payoff is going to be more likely and more immediate than the same intervention that gets a kid to start college, but who still needs to complete four, five or six years. Q. How does all of this manifest within the state? A. In the commonwealth, it’s everything from a kid who’s currently at a community college in Virginia and has most of the credits they need to graduate, but is at risk of withdrawing. We’re reaching out to that student to help them get over the finish line. Q. In your work, you talk about the need for students to have a road map. Why is this so important? A. If you’re from a family that is, say, third- or fourth-generation at UVA, you grow up implicitly knowing what to do. If you’re from a first-generation family, you’re just as smart, just as talented, but you don’t have the benefit of that college literacy. I think [we have to help] students anticipate how to choose courses that are going to advance them toward their major, when they need to reapply for financial aid and make sure students are well aware of the broad range of academic, social support and activities that are available to them at a place like UVA. Q. What is your new “Nudges, Norms and New Solutions” program? A. It’s an educator-oriented guide that we wrote with the goal of taking evidence-based nudge strategies outside of just the research and policy community and putting information on how to implement them directly into the hands of educators – whether that’s a high school counselor, a college administrator or a college adviser at a community-based non-profit. It’s a broad adoption effort to expand the use of this work beyond just the research community. Q. What are some examples of behavioral strategies and approaches to encourage students? A. One of my favorite examples is a project, conducted by my doctoral adviser and now dean of the Harvard Graduate School of Education Bridget Terry Long and her colleagues, that incorporated support for low-income families to complete the Free Application for Federal Student Aid into the income tax preparation process. What’s really brilliant about it is that when families come to do their taxes, they have all the information that they need to apply for financial aid – so even if families aren’t aware that there is financial aid available or that they might qualify for it, the tax preparer has all the information right there and can ask them if they have a senior in high school who might be going on to college next year. If so, would you like to fill out these applications that can help you get financial aid? This was rigorously evaluated and it was found that just this eight-minute intervention to do financial aid applications increased the share of kids who went to colleges and stayed in college for at least a couple of years by about 30 percent. Q. What else are you up to? A. We have helped found, and are managing, a national prize for innovations that improve college completion or workforce outcomes for low-income youth. It’s funded by the Greenwald Family Foundation. It’s a different approach to encouraging, at the organizational level, the kinds of investments and programs that can really improve outcomes. This is the first year of the prize and we just finished the end of the application window. A committee of judges is now reviewing applications. On Oct. 15 at an awards dinner, judges will announce a winning organization that has the best evidence to date of improving college or workforce outcomes for low-income youth and has a path to scale its impact. That organization will get $125,000 in recognition of its work and to support its scale. You can learn more about it at Evergreenprize.org.